Aalayam - Colors, Cuisines and Cultures Inspired! : Kids room decor - featuring a little boy's retreat! 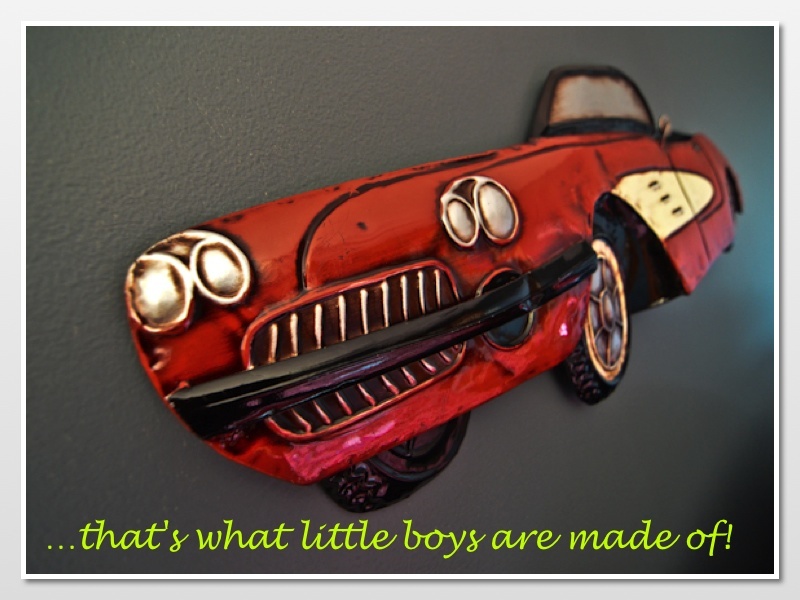 Kids room decor - featuring a little boy's retreat! Hello dear readers! Today, I bring to you images of another room from our home and this room belongs to the youngest member of our family - my 9 yr old son. An Aalayam reader wrote to us asking for a feature on kids room decor and this post has been brewing for a while now. As I have said before, I am no design expert and during the day, I am a physician helping patients. 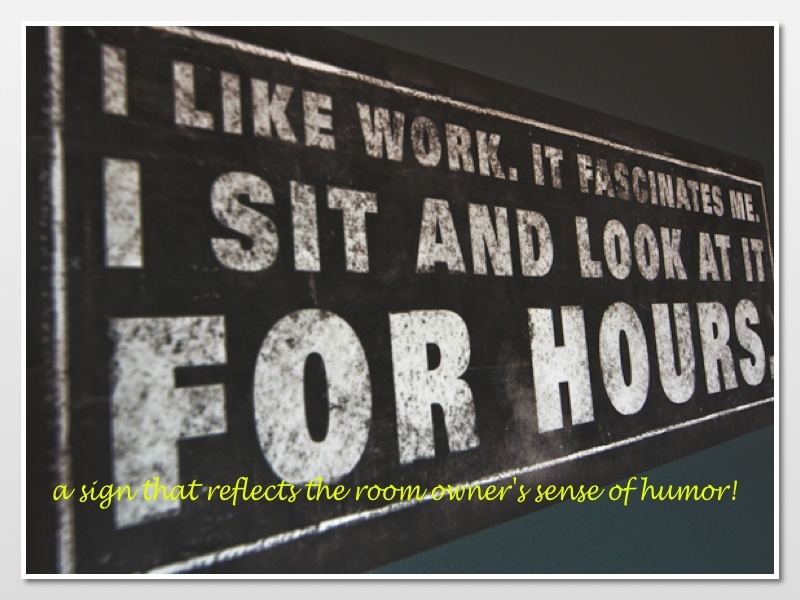 I dabble in design and decor experiments simply for the joy it brings. 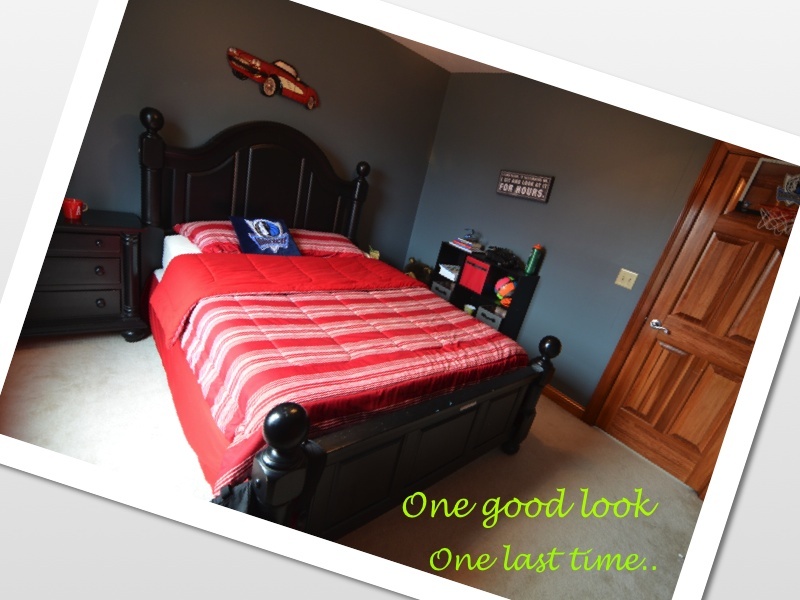 I will share my experience decorating my son's room in the hope that it will inspire your own decor projects. This project entailed working with a real client who had tough expectations and very specific requirements and quite honestly, it freaked me out! From the word go, we disagreed! Creative difference of opinion with your 9 yr old is no fun! 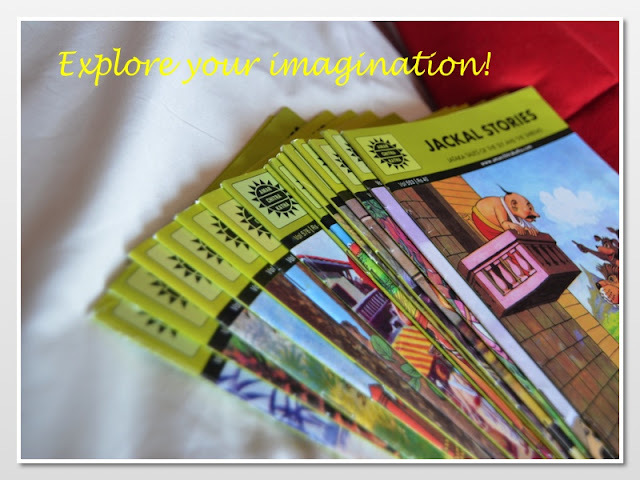 I envisioned a bright and colorful room which would set the stage for fantasy, merriment and many childhood crusades! So, when he said "Mom, I want the walls to be gray" - I almost fell off my chair! Really? A somber gray? However, my little one had a clear vision and he knew what he wanted and I wasn't going to argue with that. After all, this was a joint project and I wanted to design a space that was an expression of his personality. 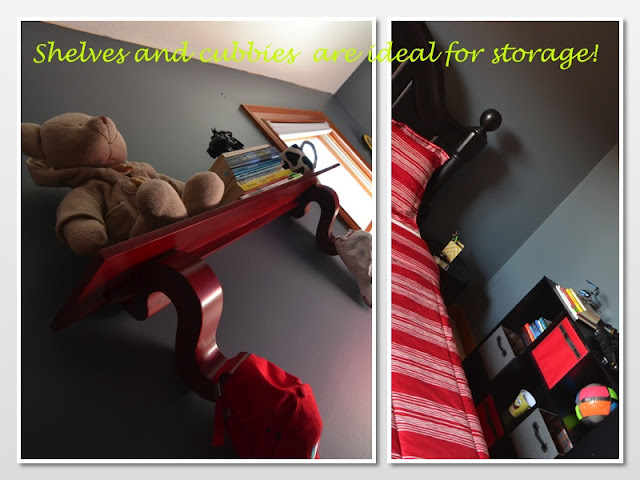 I already had furniture for his room from our previous house and so we only had to work out a few other details like bedding and accessories. Fairy simple, right? Well, almost… barring the few kinks along the way but in the end it was well worth the effort! Let me start with the furniture. I bought all the furniture back in 08 when he was 5 yrs old and had just outgrown his baby/toddler stuff. I wanted furniture that would last through his growing years yet be kid friendly and age appropriate for his pre-teen years. Basic black seemed to fit the bill. I opted for queen size and reasoned I could accommodate guests in his room in a crunch situation. 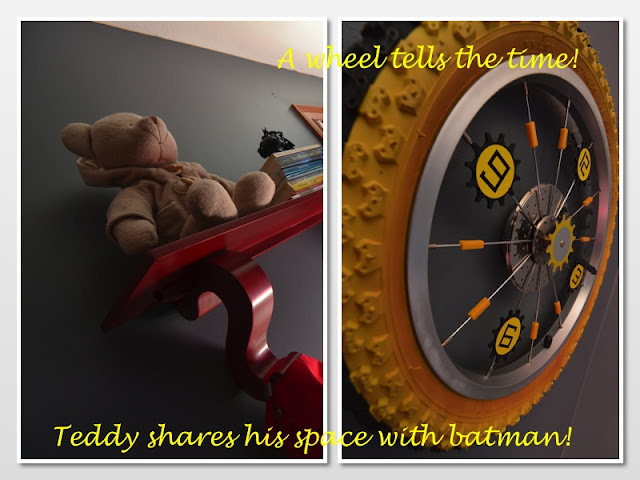 Our guests did not seem to mind the kid's decor so long as they had a comfortable bed to sleep on and so, it has worked out well in the past! 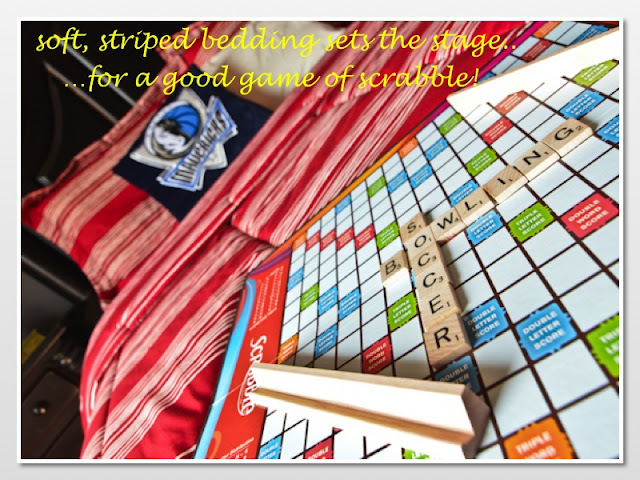 Plus on a cold winter afternoon at least a half dozen kids pile up on the soft and cozy bed for a round or two of board games and the adult sized furniture is a definite bonus then! Five years later, we still love the black furniture! On the flip side, finding queen sized kid's bedding has been hard! Most bedding sets for children come in a twin or a full size and if you are looking for a particular color or theme, it makes it that much harder with queen sized furniture - just a warning! Once the walls were painted, the room looked gorgeous in gray. We talked about our color palette next and he wanted yellow bedding. No particular theme, just yellow bedding. Yellow and gray - that's trendy! Now we are talking, I said to myself! Unfortunately, our search for the perfect yellow bedding took us nowhere! They were either too fancy or too pricey! So, we decided to go with plan B and that's how we ended up with the striped red bedding. Just basic red and white stripes - in the right fabric and texture. This seemed appropriate and functional for a little boy's room. With neutral colors like gray and black anchoring the room, the red bedding adds the right amount of style quotient that this room needs. The large window on the south end allows for some great views on the outside and slowly the room was shaping up nicely on the inside as well. The end goal was not to create a perfect space but to have a space where he can work, play, shoot some hoops, play some violin, explore, be creative and have fun as the magic of childhood unfolds! I have always wanted my child to have an appreciation for beauty and structure. And collaborating on this project was a fun way to see him appreciate design and make insightful comments and intuitive choices. 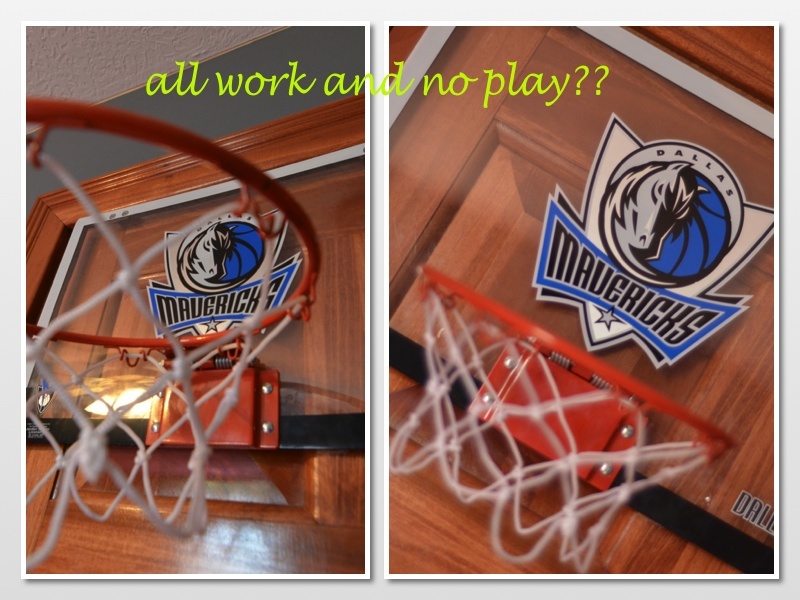 Every kid's room needs some fun elements - ours came in the form of a wheel clock, wall accents, a basketball hoop and a sign that reflects my son's sense of humor. These elements make this room a happy place and I hope will one day help my son to fondly remember his childhood. I wanted to keep the decor non-fussy and had to hold myself back from going overboard. And lastly, the storage or the big dilemma! You can NEVER have enough storage and the pictures don't tell the full story. The nightstand with drawers, the cubbies and shelves help to store books, toys, games, school and art work but not entirely. The remainder is stored in the closet and the clothes are housed in a big armoir. We have a ton of books that are stacked in different areas of the house and that helps! So, there you go - a little boys room! Some planning, a checklist, my child's bright-eyed enthusiasm, and our combined creative energy was all it took to create this lively place in our home! Thank you honey for letting me share your room with our readers! We still have a couple of minor projects pending including framing some of his artwork but for now we enjoy lying on the bed and looking at the moonlight streaming in through the large window at night! Got it ? Well, watch this space, dear readers, for a spotlight feature on ACK sometime in the coming months! I will sign off for now and as always we love your feedback, comments & requests. P.S: Please note that all images are from my home, taken by my husband and subject to copyright. Cannot wait to get lost in those comics myself !! Awww such a prettyyy room..
Shaz: thanks much! it was fun working on this room! Nayana: Thank you for your kind words. 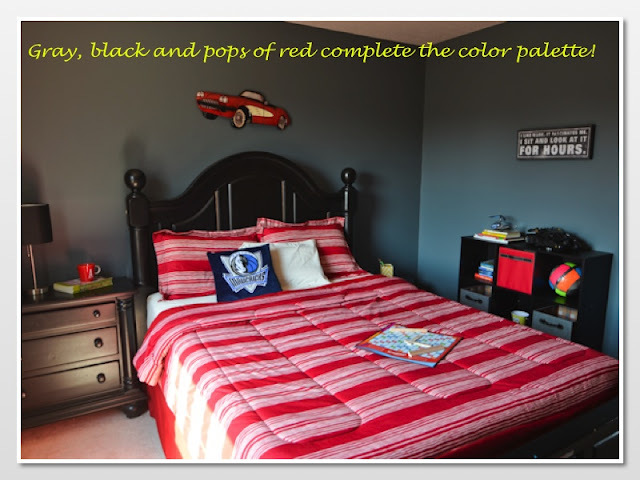 You can always buy regular bedding in a fun color and accessorize the room with kid friendly decor and with your great DIY skills you should have no trouble at all! I make my weekends go a little further, I guess :) - stretch the 48 hrs to fit in a lot of things!! ..jus' kidding! You are right, I consider myself to be truly blessed to be passionate about my work and my hobbies and I have to acknowledge my supportive family and my great blog partner! lollipopmoons: thank you for stopping by Aalayam and your feedback. We hope you will stop by more often as we have an exciting lineup of topics and posts! -Beautiful Deepa ,A's is the BEST!!!!!!!!!!! -you are the best! amazing post! - Loved this blog! Both your creativity with the room decor and your description! Thank you all! we appreciate you all taking the time to read our posts. A has inherited dad's style and mom's keen eye for decor! Lovely room. Loved the decor of this room. Having recently bought a house here in US, I find myself looking at your site frequently for decor ideas. Regards the ACK comics, those are priceless and a HUGE part of my chidlhood. I'm currently looking to buy them for my little girl. Can you please tell me if you bought it on the ACK website (www.ack.com). There are a bunch of sites out there and I want to be 100% sure before I place the order. And also what did you think of the service? welcome to Aalayam. We find it humbling that you would find us resourceful in your home making process! Unfortunately,our ACK comics were a gift from my mother-in-law. But I can try to find out for you. 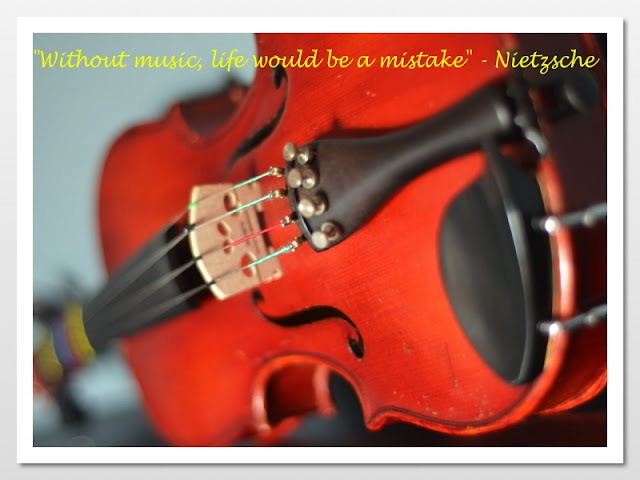 Stay tuned - we have many more inspirational posts coming up! Lovely room Deepa. I just recently moved into a new house and asked my sons to pick the color for their rooms. My 12 yr old picked Teal and brown and my 8 yr old picked red and green. I was pretty apprehensive about the red and green, didn't want the room to look like a christmas tree. But surprisingly the shades he choose look very good in the room :). There was no trying to change their minds about the color. The ACK - brings back fond memories. My Husband has built quite a collection for the boys. We now have around 180 books. Radhika: Ooh! can't wait to see your painted rooms! those sound like fun colors for boys' rooms! see my response to your other comment. Vow! 180 ACK comics - that's quite the collections and thanks for sharing your experience with ACK website. COme back ladies we have so many more conversations to have! Thnak you so much ladies for the feedback on ACK. This really helps. Such a fun room for a boy! anjana : thanks for stopping by and welcome to Aalayam. 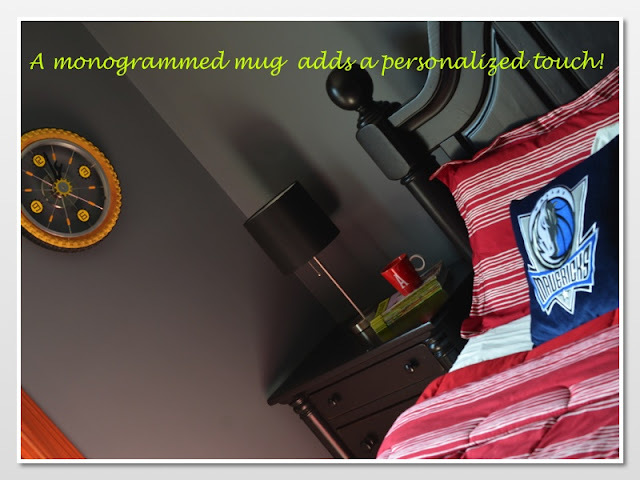 Yes, my little boy loves his room and has a sense of belonging and responsibility.